Synopsis: Financial crime is an important and topical area. Concerns over money laundering have grown considerably since links with terrorist organisations have become more apparent in recent years. This new book sets out to provide banks and legal advisors with a practical and international guide to the issues surrounding banks and financial crime. It looks at the problems banks now face and the legal solutions required to remedy these. The book starts by looking at what exactly financial crime is and how it happens, moving on to look at the international aspects of the law of tainted money. The authors then examine aspects such as the regulatory responsibilities and private law duties of banks including their liabilities to third parties and their obligations to assist persons seeking the recovery of assets. 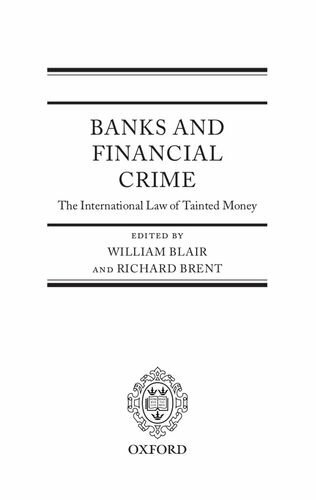 Issues such as substantive private law claims that banks may face are considered, particularly from the perspective of their customers and of victims of financial crime, where a bank has in its possession 'tainted money'. A comparative approach is taken with civil jurisdictions and US law. The book concludes by considering possible future developments of the international law of tainted money, including coverage of any potential problems that are anticipated and a view on the likely effectiveness of such international law.